K-Street/Wall Street pleasing tax cuts, narrowly focused revenue raisers that will be subject to withering attack on the Senate floor, nonsensical vote-driven compromises and outrageous fiscal gimmicks----the most blatant of which is the sun-setting of every single individual tax provision after 2025. This latter trick is designed to shoe-horn the revenue loss into the $1.5 trillion 10-year allowance in the budget reconciliation instruction and also comply with the Senate's "Byrd Rule" which allows a point of order to strike down a reconciliation bill that increases the deficit after year 10. Save for these gimmicks, the actual 10-year cost of the Senate bill would be $2.2 trillion including interest on the added deficits. Nevertheless, this and other sunset gimmicks also underscore how threadbare the whole undertaking has become. To wit, the bill provides interim, deficit-financed tax relief of $1.38 trillion during 2018-2025 before these budget gimmicks kick-in, which is not a big number in the scheme of things: it amounts to just 4.2% of current law revenue collections during the eight year period, and only 0.8%of GDP. Since the bill doesn't even really cut marginal rates during this interim period (the top bracket drops from 39.6% to 38.5%), its hard to see how a mere 0.8% "stimulus" to GDP is going to incite a tsunami of growth and jobs. As we have frequently pointed out, the Reagan tax cut of 1981---which had no measureable effect on the trend rate of economic growth--- slashed marginal rates from 70% to 50% and as a total package paled the current Senate Plan into insignificance: It reduced the Federal revenue base by 26%, not 4.2%; and it amounted to 6.2% of GDP, not 0.8%, when fully effective in the later 1980s. Moreover, the "fully effective" part is especially salient because the Senate bill's impact does not widen with time, as do most permanent tax cuts which require phase-in periods, but, instead, shrinks into virtual insignificance. Thus, the bill's net tax cut amounts to $225 billion or 1.1% of GDP in 2019, but by 2022 the net cut shrinks to $199 billion and 0.9% of GDP---and then to just $145 billion or 0.6% of GDP in 2025 when the sunset gimmick kicks in. Thereafter the bill becomes a small net revenue raiser ($31 billion) by 2027, but, more importantly, the single "cut" item left in the statute tells you who is really driving the show. That is, the Business Roundtable, the K-Street industry lobbies and Wall Street get to keep what they mobilized for----the 20% corporate rate cut, which stays in place permanently at a cost of $171 billion in 2027 revenue loss. However, the lopsided math laid out in the Tax Policy Center's price-out of the Finance Committee reported bill underscores why this dog's breakfast will never make it close to the Donald's desk. That's because by year #10 not one of the 150 million individual filers get a tax cut; the reduction for small business "pass-thru" payers is zeroed-out; and the balance of the bill consists of an incredible $202 billion of tax increases in 2027 compared to current law. That's right. The great Republican "tax cut" slithers off the stage in 2027 raising taxes by a net of $75 billion on individual filers, $123 billion on business filers (aside from the corporate rate cut) and $4 billion on international companies. So what you have is a sharply downward sloping taper of tax cuts and revenue losses, which makes the bill a classic Keynesian deficit stimulus through the tax code, not a supply side incentive driver; and one so tangled up in the nation's fiscal strait-jacket that it ends up in political la la land. For instance, the only individual tax provision that is not subject to the 2025 sunset is the tax indexing modification which relies on a shorter ruler to adjust the brackets and standard deduction for inflation. Accordingly, by 2027 approximately 150 million filers will be paying $32 billion per year in higher taxes! Another fiscal anomaly contained in the bill in order to shoe-horn it into the allotted $1.5 trillion deficit add-on is the repeal of the individual mandate under ObamaCare. To be sure, as a matter of policy and liberty we would be the first to say, right on! But here is how the bill reduces the deficit by $53 billion in 2027 and $318 billion over the 10 year period. To wit, it assumes that about 13 million citizens are being forced to join Medicaid or buy subsidized health insurance policies on the ObamaCare exchanges who do not want them, and don't even need the coverage, apparently. That's completely crazy, of course, but is also par for the course in today's American Welfare State and the fiscal impact and analysis thereof. Indeed, the intuitive notion would be that repeal of the ObamaCare fines would cause an increase in the deficit, and, in fact, the CBO analysis assumes a $43 billion revenue loss over the 10-year period from uninsured individuals no longer being forced to pay fines to Uncle Sam for exercising their right to self-insure, pay cash for care or go without. Still, the repeal provision is projected to net $318 billion of "payfors" because a different set of needy people are presumed to reject mandatory welfare. That's right. The CBO projects that Medicaid costs will be $29 billion lower than current law in 2027 and $179 billion lower over the 10-year period because millions of low income citizens---and this is hard to type with a straight face----would otherwise sign up for Medicaid, which they would be qualified for but don't want, in order to avoid paying a fine! Stated differently, CBO essentially assumes that millions of low income citizens are being fined into enrolling in Medicaid when they don't want Uncle Sam's free stuff; and that millions more would give up their ObamaCare tax subsidies of up to $15,000 because they no longer would have to pay a fine of about $2,000. You can't make this stuff up---but there is a reason for the apparent lunacy. What is going on here, in fact, is that 30 years of fiscal kick-the-can is coming home to roost. The overhang of $10 trillion of additional built-in deficits over the next decade, and a prospective public debt of $31 trillion is tying the GOP tax-writers in knots, and well it should. That's because a meaningful tax cut not paid for with spending cuts (preferably) or a more benign revenue raiser like VAT or a consumption levy is simply unaffordable and counter-productive. A deficit-financed tax cut will result in "crowding out" and higher interest rates in the years ahead----meaning headwinds to growth, not enhancements. That's because for the first time since the 1980s the Fed and other central banks will be selling government debt, not buying it; they will be in a demonetization and QT (quantitative tightening) mode rather than one of massive monetization and QE. Yet it was only the latter which permitted the fiscal profligacy that quadrupled the public debt since the turn of the century (from $5 trillion to $21 trillion) to roll forward year after year unchecked by visible, adverse financial and macroeconomic effects. Now comes the payback. Indeed, given the nation's rapidly aging and welfare-consuming demographics, its $66 trillion albatross of public and private debt on a sputtering $19 trillion economy and Washington's 5% of GDP structural deficit during the next decade even under CBO's nirvana of perpetual full-employment, the very idea of an unfinanced tax cut amounts to what Senate Leader Howard Baker called a "riverboat gamble" back in 1981. And that get's us the most absurd twist yet in the GOP's futile attempt to fit its big fat political foot into the purported golden slipper of tax reduction and reform. It happens that Senator Baker's legatee representing Tennessee in the US Senate, the now retiring Bob Corker, has exactly the same concern as his illustrious predecessor. Namely, the objectively warranted fear that tax cuts do not pay for themselves----and most especially in the case of the dog's breakfast now heading toward the Senate floor. Indeed, Corker has explicitly stated that he will vote "no" on any bill that increases the Federal deficit----after any favorable impact on economic growth and the revenue feedback therefrom. Apparently, the good Senator is not at all convinced that the sole permanent beneficiary of the Senate bill---corporate America----will use most of its $1.35 trillion in increased after-tax cash flow over the next decade in order to invest in domestic plant, equipment and technology. And in sufficient incremental quantities to generate meaningful revenue reflow. The skunk in the woodpile here, in fact, is that Corker has been a long-time member of the budget committee and reasonably consistent deficit hawk (except on defense where he is a raging war hawk and spender). Accordingly, he is actually numerate and understands the forbidding math of the corporate tax cut. To wit, at the permanent 20% rate, the tax cuts would have to generate nearly $7 trillion of incremental pre-tax profits to pay for itself; and given the pre-tax profit share at 12% of national income, the total gain in GDP would need to be in the order of $60 trillion! At the same time, the corporate C-suites already face the lowest debt and equity costs in history thanks to decades of radical financial repression by the Fed, on the one hand, and are now addicted to financial engineering, on the other. So it is not unreasonable to assume that at least 65% of the corporate rate reduction will be allocated to higher dividends and stock buybacks. In short, to pay for itself, the 20% corporate tax rate would need to generate $60 trillion of incremental GDP over the next decade from perhaps $500 billion of incremental investment. That is to say, a 120X yield on investment in an economy that has actually not been acutely deprived of investment dollars over the last decade. In the alternative, of course, added investment might also generate some incremental employment and income and payroll tax revenue. But that would likely be a strictly second order effect: Hardly a single CEO at a recent meeting with Gary Cohn raised his hand when asked with the 20% rate would lead to more jobs or higher wages. Undoubtedly, Senator Corker (and his fellow deficit hawks including Flake, Lankford and others) will lean hard toward the most favorable assumptions possible about the share of the corporate cut that will be reinvested rather than distributed to shareholders, and the yield of GDP and pre-tax corporate income which will result therefrom. But they will not get close to a 100% "payfor" conclusion---so they have invented in new morsel to throw into the Senate dog's breakfast. Namely, a "tax cut" written in disappearing ink or what they are pleased to called a "trigger-tax" increase in the event that the dynamic reflow assumptions do not pan out. "Corker, the retiring Tennessee Republican has staked a hard line against letting tax legislation add to federal deficits - saying that a single penny of new deficits would lose his vote. It turns out the Senate bill would add $1.4 trillion to the deficit over 10 years - at least before accounting for any economic growth - according to a Congressional Budget Office report released Sunday. The bill’s supporters say it’ll boost economic growth enough to cover that shortfall, but Corker says he’s not satisfied. He wants a backstop mechanism - essentially a tax-increase trigger that would raise revenue in case the promised growth doesn’t result. Arizona’s Flake and Oklahoma’s Lankford also support that kind of trigger. Needless to say, the crafting of a trigger-tax is beyond the capacity of the US Senate to devise while in full partisan floor battle or at any other time. The problem is, what is the baseline for measuring any revenue shortfall, and what happens if the short-fall is due to a recession or some other un-programmed economic development? Or even a multi-quarter growth hiatus that may or may not be the on-set of an officially designated "recession" by the authorities at the NBER. You editor speaks with some authority on this point---having helped devise such a "trigger tax" back in 1983 when Ronald Reagan was looking for a way to raise taxes to stem the exploding deficit caused by the 1981 cut without admitting he was back-tracking. The long and short of it was Reagan's "trigger tax" never got off the ground because even the threat of a trigger release causes its own set of adverse but impossible to quantify economic feedbacks. Even then, the Senate bill has not yet begun to fix all the other "problems" that would be required to find the 51-votes. For instance, Senators Johnson and Daines---both former small businessmen and "pass-thru" tax payers----are holding out for a better deal for the millions of small business owners who won't benefit from the K-Street/Wall Street driven cut in the corporate rate. As presently written, pass thru payers would face a 30% rate on qualifying business income rather than 20%, and that's only until 2025. 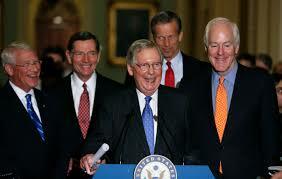 After that they get zip---even as the corporate rate remains permanent. The problem with the "fix" needed for these two Senate votes, of course, is that even the 30% pass-thru rate costs $25 billion per year and there is no room in the fiscal envelope. Likewise, the latest distributional analysis shows that in 2025---before the sunset---the bottom 30 million tax filers would get an average "tax cut" which amounts to the grand sum of $1.15 per week----and, no, we did not omit any zeros. Similarly, the next 30 million filers would only get $7 per week; and the middle quintile----the 30 million tax filers between $55,00 and $95,000 per year and the heart of the middle class----- would get just $17 per week of tax relief in 2025. That is, before it all disappears into the sunset! As we said, the GOP might better pass a two-word tax bill and be done with it. Better still, it might consider the possibility that the great barrier to growth in America today is not the tax code, but the Fed and its massive inducements for speculation on Wall Street, rather than investment and growth on main street. Indeed, given the warm welcome that most GOP Senators are giving to the new Fed Chairman----that is, Janet Yellen in a tie and trousers---that avenue of inquiry is more than warranted. As we will argue tomorrow, US taxes are always too high and should be cut along with parallel reductions in spending and the deficit. But short of that, it is hard to say that American producers struggle under some kind of severe competitive disadvantage in the global economy. 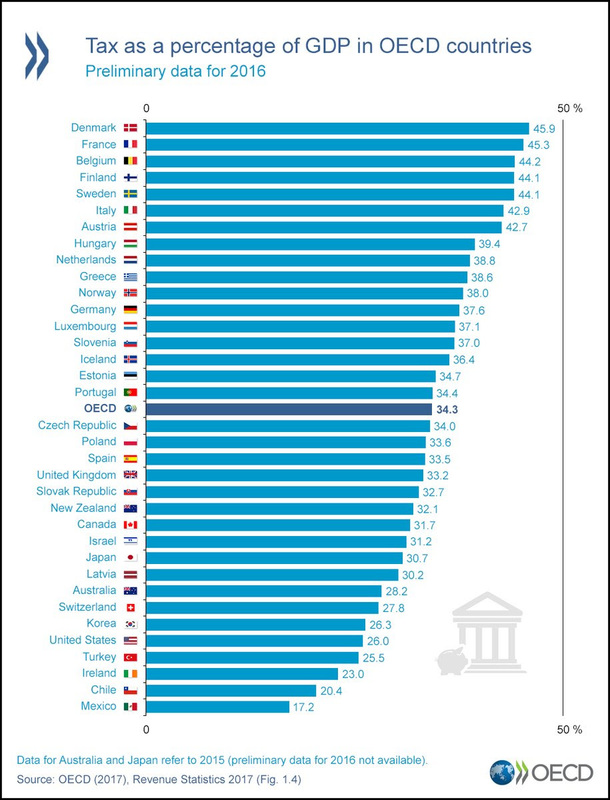 In fact, only Ireland, Chile and Mexico have lower tax burdens among all OECD countries, and the US rate at 26% of GDP is actually one-fourth lower than the OECD average. Corporate tax rate in Shenzhen and in Bombay: 10%. This is part of the reason for the jobs drain. Was tax reform part of his campaign?